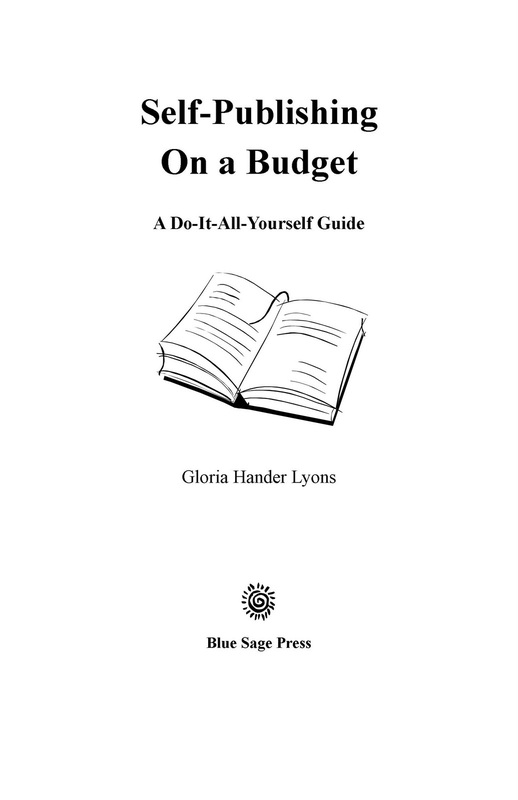 You can become a published author with the information from my book, Self-Publishing on a Budget: a Do-It-All-Yourself Guide. Whether it's a family cookbook, a memoir or how-to manual, you can see your work in print. Self-publishing is easy, fun and affordable. 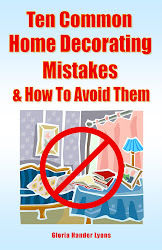 Read the excerpts from the book on this blog to learn how. Don’t pass up the chance to see your work in print. 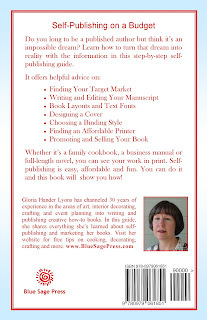 Self-publishing is easy, affordable and fun. You can do it and the information on this blog will show you how you how! 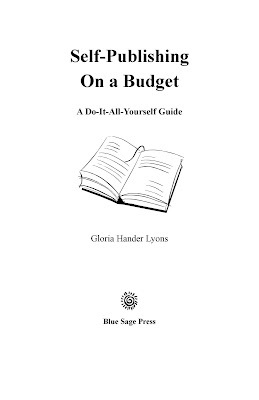 Whether you want to preserve a collection of cherished recipes for family members, publish a memoir, or write a marketable how-to manual, Self-Publishing On a Budget: A Do-It-All-Yourself Guide will show you how to gather the information and put it together into a properly formatted book. Anyone can accomplish this task, and on a reasonable budget. Self-publishing can encompass a wide range of literature, from a 24-page booklet that you print on your own computer to a 300-page hardback novel that’s typeset by a professional printer. It’s whatever your vision and budget will allow. All you need to do is pick a subject and start writing. What information have you acquired during your lifetime that you can share with others? Write about what you know—your life experiences, hobbies, travels or career expertise. Perhaps you enjoy writing short stories, poetry or full-length novels. The publishing process is the same for both non-fiction and fiction books. Self-publishing is fun, affordable and rewarding. Even if your goal is simply a cookbook for family members or an information booklet for business clients. The satisfaction of holding that finished book in your hands is well worth the effort. 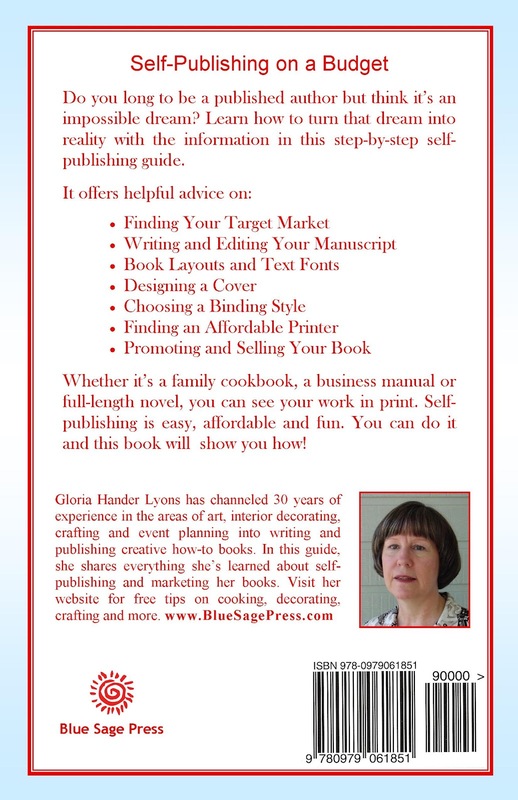 Use the easy, step-by-step self-publishing tips in this book to share the knowledge you have accumulated with others. Don’t pass up the opportunity to see your work in print. The first decision you’ll need to make as a self-publisher is: What is your purpose for publishing your book? Do you merely want to record your family history or preserve a collection of favorite recipes to share with family members? Are you a business professional who wants to produce a booklet to give to your clients to help clarify terms that are specific to your industry? Do you envision writing a book to sell to the general public and generate a source of income? The answer to this question will determine most of the choices you make regarding your book, from the number of copies you’ll print, to the cover style and production cost per copy. If your goal is to make a profit from self-publishing, then the first task on your publishing journey is to determine your sales market. A good way to do this is by drafting a book proposal or marketing plan. Even if you’re the only person who will ever read it, this proposal will help you clearly define what information you want to include in your book and how to present that information. You should be able to write in just a short paragraph or two what your book is about, what you hope to accomplish by writing it, what benefits or solutions it offers to readers, who will buy it and how you can reach your buyers. Even if your book is fiction, creating this condensed version of your story will help you stay focused during the writing process. A good model to follow for your proposal is the “sales pitch” found on the backs of books on book store shelves—especially those in the same category as the one you plan to publish. Compare several of these to get ideas for writing your “back copy”. 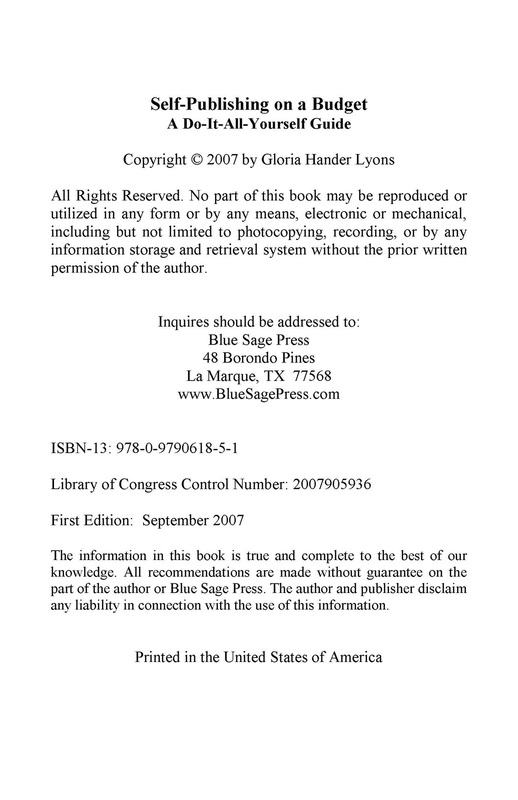 See the "back copy" example for this book at right (click on the image to enlarge it). The sales pitch you create will help you get a clear focus for writing your book. Do your homework to make sure that the information you include is concise, accurate, well written and right on target for the market you want to reach. Before publishing your book you will need to choose a trim size, the actual dimensions of the book. The most popular and economical book trim size is 5.5” X 8.5”. There are other alternatives, which are sometimes more expensive, depending on the book printing company, that include 6” X 9”and 8” X 8”, which is considered a gift-size book. If you use a book printer like CreateSpace.com, all the book trim sizes are the same price. The cost of the book varies only by the number of pages in the book and whether the interior is black and white or includes color photographs. Not all printers offer all trim sizes, so shop around to find the one who offers the book size you want at an affordable price. In order to lay out the body text pages for your book, you will need to be familiar with a word processing program, like Microsoft® Word. As you write your text on your computer, having the page size set to the actual trim size of your book will give you a better feel for how the finished layout will look, complete with the total number of pages. Most book printers require a minimum half-inch margin around the text on each page. If your book will be perfect bound (like a paperback book) instead of bound with a spiral wire or plastic comb, it’s best to use mirror margins. “Mirror margins” means the inside margins (the ones at the center of the book) are wider than the outside margins, to accommodate the space required to bind the pages together. In order to create mirror margins when using Microsoft® Word, click on the “Page Layout” tab, then choose “Page Setup”. Under the “Margin” tab, you will see an area called “Pages” and under that, “Multiple Pages”. Click on the drop-down arrow and choose “Mirror Margins”. Then you will be able to set the inside margins to at least three-fourths of an inch wide and the outside margins at one-half of an inch wide. If you don’t want to use mirror margins, simply set both the right and left margins for three-fourths of an inch (.75”). You can also set the top and bottom margins the same size if you like. Follow the directions from the book printing company you choose. Many book printing companies, like InstantPublisher.com, offer downloadable templates with preset margins for several trim sizes. This service makes creating your book file much simpler. Be sure to insert page numbers in the body text. These can be centered in the footer (the space at the bottom of the page), or in the header (the space at the top of the page) or placed in the outside corners of the header or footer. In addition to the body text, your self-published book will also contain other pages, called the front and back matter. These pages typically do not have page numbers, or they are numbered using Roman numerals. Start the regular page numbering with your introduction or first chapter and end the numbering before your back matter pages. Front matter includes: a title page, copyright page and a table of contents, and possibly a dedication page, an acknowledgement page, a foreword and a preface, if you want to insert these, as well. Back matter can include some or all of the following: an index, appendix, glossary of terms, resource guide, bibliography, author information and order form. 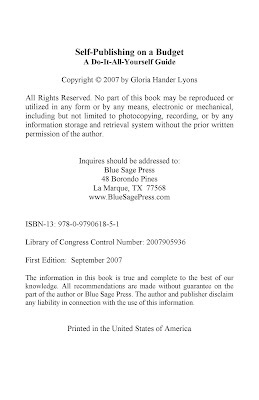 The copyright page is the second page of your book (also called the verso page because it is located on the left-facing or verso page). This page is reserved for the copyright information. The book’s title is at the top of the page, followed by the word, “Copyright” and/or ©, the year the book was written and the name of the copyright owner (you). It must also include the statement, “All Rights Reserved” to protect all rights to the book. Click on the sample copyright page at above to enlarge it. • If you have them, list the book’s ISBN (International Standard Book Number) and Library of Congress Control Number. These numbers will be discussed later. A foreword is written by a person other than the author. It is usually about one page long and includes positive comments about the author and the book, plus the name of the person who wrote the foreword. If you want to include a foreword in your book, consider asking for comments from a well-known person in the field relating to your book’s topic. You might also query someone famous whose endorsement could boost your book’s sales. It never hurts to ask. If you do manage to land a “big name” person to write your foreword, be sure to include this fact on your cover. The preface is very similar to an introduction, but is a bit more personal and chatty. It is written by the author and might include the story of how he or she came to write the book and somtimes ends with a printed copy of the author’s signature. The preface gives an overview of the book’s content, information about the author’s background or credentials and might also point out special features the book offers and how to use them. 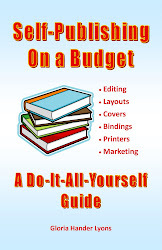 Read more about front and back matter in Self-Publishing On a Budget: A Do-It-All-Yourself Guide. After finishing the text layout for your book, you’ll need to design the cover and choose a binding style. These are both extremely important to the book’s appearance and functionality. If your goal is to make a profit from the sale of your book, then you should consider a full-color cover. Covers help sell books, and an attractive, eye-catching cover will attract more buyers. We have already discussed choosing a title that grabs the reader’s attention. For non-fiction books, a subtitle that further explains your book’s topic is also a good idea. Example: The Secret Ingredient: Tasty Recipes with an Unusual Twist. You have just a few seconds to capture a potential buyer’s interest. Make sure that every word on the cover of your book is working to make that sale. This includes a catchy title, informative subtitle, back copy that clearly states the benefits or solutions your book offers, plus the author’s credentials and reader testimonials or book review comments if you have them. The average cost of a professionally designed book cover can range from $500 to $2,000. Since our goal is self-publishing on a budget, you will probably need to consider other options. Conduct some careful research at your local book store. Study the cover designs of books in the same category as yours. Take notes about a few that you like: colors, font styles, layout and anything else that appeals to you. Pay particular attention to the back copy to compare what benefits or solutions the other books offer with what you plan to present. Also check the table of contents to make sure your book will be better or different. It must stand out from the crowd in order to sell. If you aren’t artistically inclined, enlist the aid of a talented friend or check into hiring an aspiring art student from your local community college to design your cover. Arm him with your research notes so he can translate your vision into a final design. Be sure to have this person sign a “Work for Hire” agreement which states that you retain exclusive rights to all artwork completed specifically for your book. Any time you pay for services, such as writing, editing or artwork, have the person sign such an agreement, which prevents them from claiming ownership and demanding a share of the royalties after the book is printed. You can find samples of these agreements on-line. Simply type “Work For Hire Agreement” into your search engine. Many book printers offer cover design assistance with prices ranging from $50.00 to $300.00. They also offer full-color templates to which you can add your title and other cover information. CreateSpace.com offers a free “cover creator” program that you can use to create your own cover when you use their printing service. You can upload photographs and choose the cover background color and font styles to customize the appearance. The program will automatically size the cover for the book trim size you choose and the number of pages in your book. The cost of printing a full-color cover varies widely from one printer to another. Some offer a free color cover with their printing services. Compare the prices and services of several printers before making your final decision. Your book’s cover is extremely important. Give it the time and attention it deserves to help make your self-publishing venture a success. Perfect: This is the most economical and the most common style of binding for paperback books, where the pages are glued together along the spine and a one-piece cover wraps around the entire outside of the text pages. Your book must have at least 24 pages for perfect binding. If it has at least 100 or more pages, most printers will print the book title on the spine, which helps potential buyers find your book on the bookstore shelves. (Only best-selling authors get the privilege of having their book covers facing out.) Many printers offer perfect binding for no extra charge. Saddle-stitched: This type of binding is used for booklets, where 8.5” X 11” sheets of paper are stacked and folded in half, forming a 5.5” X 8.5” booklet, and then stapled together along the fold. The number of pages must be in multiples of four because two pages are printed side-by-side on both sides of one sheet of paper. This binding can accommodate 8 to 64 pages (2 to 16 sheets of paper) and works well for books that need to lay flat when open. Plastic Comb: This binding style also works well for cookbooks and manuals that need to lay flat while being used. It usually requires a minimum of 40 pages and can accommodate up to several hundred pages. The combs come in a variety of colors, and some printers will print the book title on the comb, which offers better visibility when the books are shelved with the spine facing out. Double wire: With this type of binding, the book is held together with a continuous spiral of wire, which allows it to lay flat while in use. The spiral wire is less visible than plastic combs and can hold up to 350 pages. The disadvantage is that the wire can be crushed during shipping or can become entangled with the other wire bindings in the same carton. Plastic Coil: This binding also allows the book to lay flat when open. It is more visible than the double wire binding because the coil is thicker, but it is more durable because it is crush proof. Plastic coil bindings can accommodate up to about 350 pages and come in several colors. Hardback (or Case Bound): This is the most expensive of all the bindings but it is also the highest quality. The pages are usually stitched together and then glued between two heavy cardboard pieces. The production time is longer than that of paperback bindings. Case bound bindings can accommodate up to about 400 pages. Carefully study all the binding styles that are available and then choose the one that provides the appropriate function for your book and is within the scope of your budget. The first decision you’ll need to make as a self-publisher is: What is your purpose for publishing your book? Do you merely want to record your family history or preserve a collection of favorite recipes to share with family members? Are you a business professional who wants to produce a booklet to give to your clients to help clarify terms that are specific to your industry? Do you envision writing a book to sell to the general public and generate a source of income? When you’re ready to choose a book printer, plan to spend a lot of time researching the services and prices of many companies to find one that is right for your budget and overall vision. There are hundreds of choices available. First of all, make sure the printer you choose offers the binding style and trim size that you want. If you plan to make a profit from selling your books, you’ll need to consider the cost of production per copy, especially if you want to sell them at wholesale prices to bookstores or other retailers. Vanity/Subsidy or POD (Print on Demand) Publishers: These are publishing companies that charge a fee that can range from $500 to $15,000 (or more) to put your book together, depending on which services they provide, including layout, editing, typesetting, cover design, printing and marketing. These companies offer fulfillment services. They ship books after receiving orders, then pay the author a royalty on the price they receive (wholesale or retail). Vanity publishers also assign one of their company’s ISBN’s to your book, which means that they will be listed as the publisher of record (not you). Rarely do authors recoup even a small fraction of what they pay to a POD publisher. Vanity publishers make money from selling services to authors—not from selling books. But if you can afford their services and don’t have the skills or resources to produce your book yourself, then carefully investigate and compare prices of any companies you are considering. "Google" the company's name and read all comments, both good and bad. Also, check the "Writer Beware" column on the Science Fiction Writers of American website: www.sfwa.org. Digital Printers: These companies will print your book in quantities of 25 to several thousand copies using heavy-duty laser printers, which are similar to home computer laser printers. The cost is quite affordable, but prices do vary, as well as services. The more books you order at one time, the lower the cost per book. You can also find a few free PDF software versions online, and some word processing packages (i.e. Microsoft® Office) now come with PDF creators. Make sure any program you use can create “High Quality Printing” PDF’s, which maintains a 300dpi (dots per inch) level for photographs if you have inserted photos into your book. “Standard” level (150 dpi) is too low. Some book printers will create these files free of charge if you use their printing services. You upload your word processing file (i.e. Microsoft® Word) to their computer, it creates the PDF file, then you place your print order. The digital book printing company that I have used and highly recommend is InstantPublisher.com. They can usually fill your order in 7-10 working days and will print as few as 25 copies. Their free software will create the necessary PDF files from your word processing document. Use their instant pricing calculator to estimate the cost of publishing your book. The more books you buy per order the lower the cost of each book. They also offer a variety of binding styles and provide affordable book cover design assistance. There is a small charge for full color book covers, bindings other than perfect (paperback) and for creating a bar code from your ISBN number to place on the back cover. POD (Print On Demand) Printers: These companies can print one book at a time or several hundred books to ship directly to your buyers. Some POD printing companies sell only to wholesale accounts (Lightning Source); others to individual customers (LuLu.com and Create Space.com). The binding styles are sometimes limited to perfect (paperback) or case bound (hardback). The royalty you receive is normally the sale price minus the cost of printing the book plus a commission fee (usually about 20% - 40% of the retail price). If you don’t want to fill book orders yourself, a POD printer can be a good option. Another advantage is that you don’t need to invest money in a large quantity of books and store them until they are sold. Prices and services vary widely, so compare those offered by several different POD printers to find the one that best meets your needs and budget considerations. 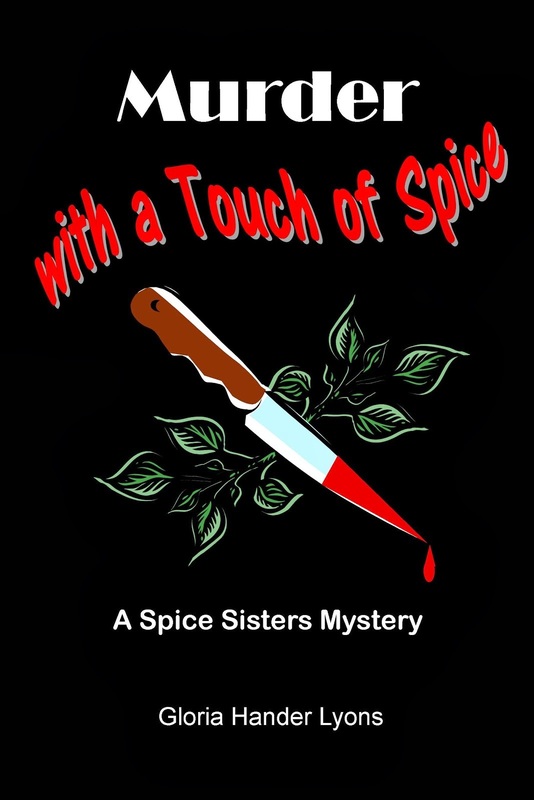 The one I have used and highly recommend is createspace.com. If you can create your own PDF files for your book's body text and cover, then you can upload them to Create Space (owned by Amazon.com). They can print and bind just one book at a time to fill orders. Your only financial obligation is to purchase one proof copy of your book. They also offer a free "Book Cover Creator" program if you don't have the skills or resources to create your own. The only binding style they offer is paperback (Perfect Binding). Create Space will post your book for sale on Amazon.com and offers "Expanded Distribution" to sell to other retail stores. 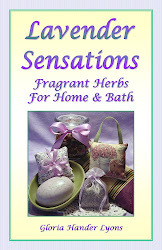 As the author, you can purchase books for your own use for a very reasonable fee. Production cost per book is the same no matter how many books you buy per order. The price is also the same for all book trim sizes. If you don't want to purchase your own ISBN, they will give you one free of charge and create the bar code for the back of your book cover for free. They will also provide a free webpage (e-store) for your book. There is no additional charge for a full color cover. Their commission is 40% of book retail price if sold on Amazon.com or 20% of book retail price if sold from your Create Space e-store, plus the cost of printing the book. 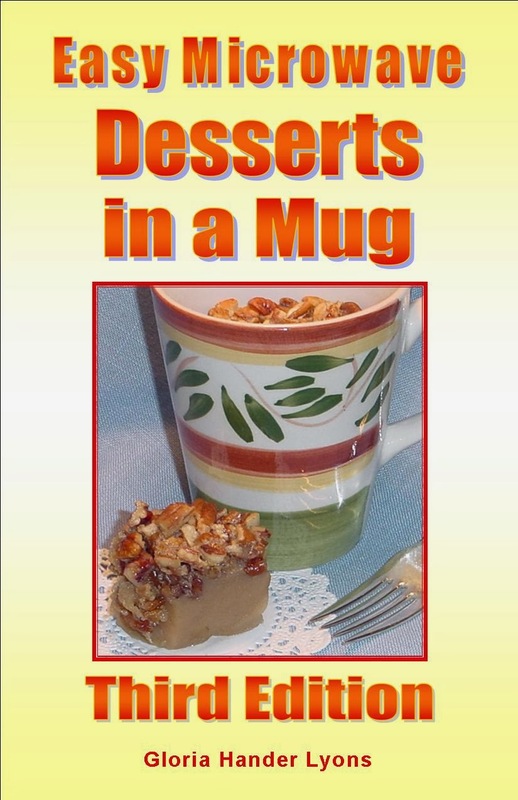 Click on the book cover above to order or read more about this fun cookbook with 100 recipes for single-serving mixes that are prepared, cooked and served in a mug in less than 5 minutes. 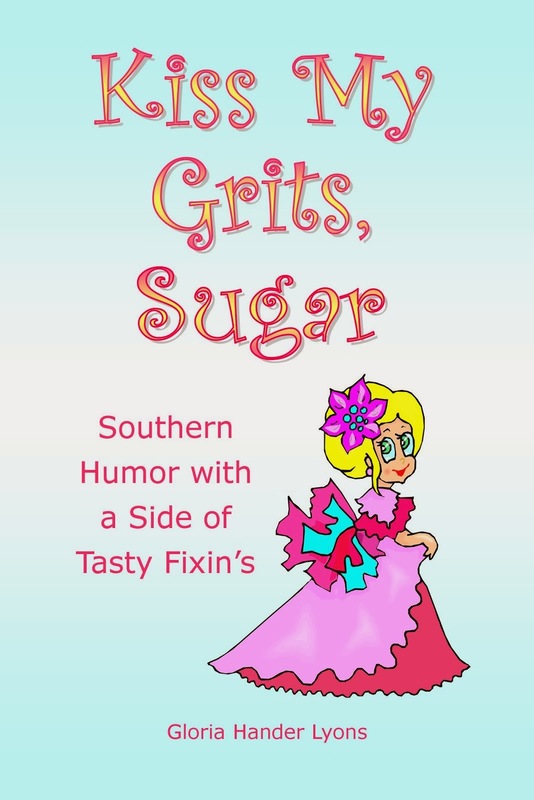 Click on the book cover above to order or read more about this fun collection of humorous short stories and tasty recipes. 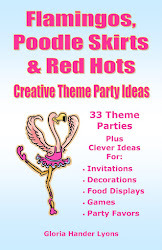 Click on the book cover above to read about all my party and event planning books for theme parties, tea parties and weddings. 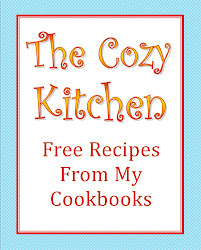 Get Free recipes from all my cookbooks on The Cozy Kitchen website. Click on the image above to get Free recipes from all my cookbooks.